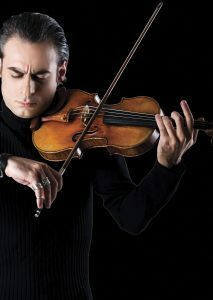 Armenian violinist Khachatur Almazian studied in his native city Yerevan with Petros Haykazian and Villy Mokatsian, and later at Brussels Royal Conservatory with Igor Oistrakh, in New-York with Misha Keylin and in Paris with Eduard Wulfson. In 1997 he won the First Prize at Belgian Radio and TV Competition. Khachatur Almazian played countless concerts with world known musicians such as Kolja Blacher, Alexander Markovich, Rudolf Werthen, Marco Parisotto, Justus Frantz, Frank Shipway, Gilbert Varga, Walter Nothas. He performed and recorded for Radio and TV with Shanghai Symphony (China), Ontario Philharmonic (Canada), Belgian Radio Philharmonic, UACJ Mexico, Moravian Philharmonic (Czech Republic), National Orchestra of Belgium, Vojvodina Symphony (Serbia), Philharmonie der Nationen (Germany), Virtuosi di Praga, Charlemagne Orchestra for Europe (Belgium), Geneva Soloists (Switzerland), Dubrovnik Symphony (Croatia), I Fiamminghi (Belgium), etc. He recorded CD for the SONORIS label (USA) with Charlemagne Orchestra. 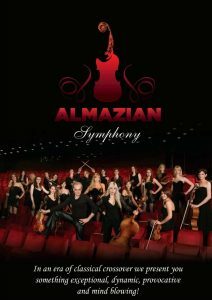 Khachatur Almazian is part of the reference book “Armenian Musicians of the world” listed with renowned artists such as Charles Aznavour, Aram Khachaturian, Cher, Michelle Legrand, Helene Segara, etc. Since 2011 Khachatur Almazian is a President of Jury of Miss Serbia Beauty Pageant.